Tuna Flakes are a deliciously popular dog and cat treat. The smoked fishy taste is irresistible and dogs & cats go crazy for these tuna flakes. Our flavourful treats for dogs & cats are Good Health Certified™. We use fresh, local ingredients whenever possible and are always tasty. 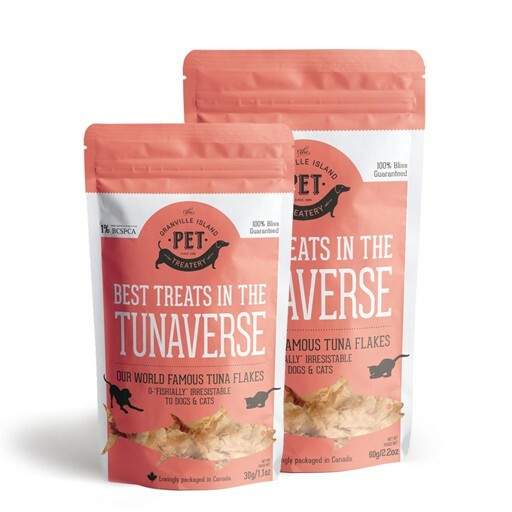 Treat your pet to wholesome goodness with Tuna Flakes, all-natural and lovingly prepared by hand at The Granville Island Pet Treatery on Granville Island.